Although as an editor for National Wildlife magazine I’m accustomed to seeing some of the world’s best nature photography, I never cease to be amazed by the quality of work that participants enter in the annual National Wildlife Photo Contest. Excellent shots even of species that until recently were rarely photographed show up in the contest every year, such as the following pictures of great white sharks and whale sharks. One of the world’s most widely recognized predators, a great white shark cruises the waters off Mexico. The white shark is perhaps the ocean’s most widely recognized predator, but it is still a creature experts know little about. However, new research is unlocking some of the mysteries of white shark behavior. A growing body of evidence suggests that the world’s white shark population is broken into three units, one centered off South Africa, another off New Zealand, and a third, the northeastern Pacific population, that ranges between California and Hawaii. A great white shark breaks the surface off South Africa, a prime feeding ground where white sharks prey on seals and sea lions. Studies conducted during the past decade show that white sharks in the northeastern Pacific Ocean have been isolated from other sharks populations for tens of thousands of years (as a species, great whites date back about 60 million years, and sharks as a group about 450 million). From late summer to early winter these sharks patrol four distinct hunting areas off California and migrate to spend the rest of the year in the open Pacific midway between California and Hawaii, an area biologists call the shark café, on the assumption that the sharks are eating there. However, at this time no one knows for sure what the sharks do in the café. The region may be a mass breeding site, or it may be where females give birth—the site of birthing areas is still a mystery. Studies off New Zealand indicate that white sharks are not born killers. The jaws of young sharks less than nine feet long are not strong enough for attacking large prey. Biologists working off California have found that the white shark’s diet changes with age, the animals often shifting from fish to mammals as they mature, but even that pattern is flexible—individual sharks tend to specialize in particular types of prey from a selection that includes seals, sea lions, dolphins, fish and squid. Studies off South Africa and California reveal that sharks seek deeper waters when hunting. The dark upper body of the shark blends in with darker waters and ocean floors in coastal areas, allowing the hunter to lurk in spots frequented by seals and seal lions. A white shark plies the clear waters off Isla Guadalupe, Mexico. The dark upper body and white underbelly help the shark conceal itself from prey. White sharks generally look for a seal silhouetted against the sky and attack by swimming straight up, hitting the luckless prey with such speed that a two-ton, twenty-foot shark may burst completely out of the water, its quarry locked in its jaws. A white shark rockets from False Bay, South Africa. Hunting sharks move deep in the water and look for a seal or sea lion sihouetted against the surface. When they find one, they attack so fast that they fling themselves from the sea. However, if a seal survives the initial attack with little or no damage, odds are it can use its greater agility to escape. A hunting great white shark crashes back into the sea at False Bay, South Africa. 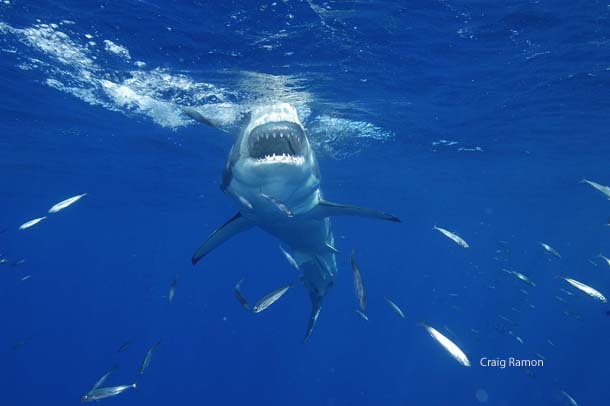 Although great whites are coastal hunters, attacks on humans are relatively rare. In 2012, about seventy people were attacked by sharks of all kinds worldwide, with seven fatalities. About sixty percent of these attacks were on people lying on surfboards with hands and feet in the water—from the water below, they would resemble a seal. Often, after a first attack on a surfer, white sharks seem to realize their error and move on without a second attack. Most sharks are harmless to humans. About half of the worlds’ approximately 360 shark species are less than 3 feet long; only 4 percent exceed 12 feet, and three of those feed on plankton, including the world’s largest, the whale shark—which at 30 feet long and about 5 tons is the largest animal in the world that isn’t a whale (the smallest shark is the pygmy ribbontail catshark, which grows to about 6 inches long). A whale shark glides through the sea off Darwin Island in the Galapagos. Despite a mouth that might be 5 feet wide, this largest of shark species feeds on tiny things, such as fish eggs. Humans pose a greater danger to sharks than sharks do to humans. About 30 million to 70 million sharks are killed annually by humans, both as untargeted species taken by the commercial fishing industry and as targets for trade in fins for soup, a luxury item in Asia that can price fins at up to $50 a pound. As a result, great whites as well as other species are steeply declining, some as much as 90 percent in the past two decades. Biologists fear that sharks will be past the point of recovery if better management is not initiated soon. Loss of sharks can have far reaching ecological and economic effects. Destruction of sharks in recent years along the U.S. Atlantic coast allowed cow-nosed rays to stage a population explosion; heavy feeding by the rays later caused a collapse in bay scallop fisheries. National Wildlife Photo Contest entrant Gary Moore was boating off Kona, Hawaii, when this whale shark came up to the vessel and followed it for 5 or 10 minutes. Whale sharks are among the species harmless to humans. The 43nd annual National Wildlife Photo Contest is accepting this year’s entries through July 15. The contest is open to all photographers 13 years old and up and all levels of skill. The Grand Prize is a trip for two to Churchill, Manitoba, Canada to photograph polar bears,l in addition to which the contest offers $6,000 in other prizes.